When you try to explain to someone what it's like to live in Southern California they don't often get it. It's easy to understand why it doesn't always make sense. There are better and worse parts of various cities. When you get down to it, a lot of it was dependent of the era when the communities were built. After World War II many folks returned home from the war and wanted to get married and start having kids. They often bought small starter homes on GI Housing allowances. These were three bedrooms 2 baths 1200 to 1400 square foot homes that sprung up all like wildfire in the decade past the end of WWII. I grew up in one of these homes in San Diego. I found it large enough for the four of us who occupied the home, but by today's standards, it's tiny. Thus the mass migration east and south to larger homes in the IE and Orange County. The city of Long Beach did a lot of growing in the post war era. Six new Catholic churches were added the city, one was Our Lady of Refuge which was founded on May 10th, 1948. Over the past 60 years, it's been fairly consistent in size with roughly 1700 families who attend the church, this is by no means a small church. It has a private Catholic Elementary School on the grounds as well. Looking at the church for an Ariel perspective you can see that it's actually in the shape of a cross. The only thing a bit more unusual is the placement of the church between the streets of Stearns and East Los Coyotes. The two streets turn the lot the church sits on into a V. The normal thing to do is place the front of the church on one of the streets. Our Lady of Refuge front faces the bottom corner of the V making a strong visual impression. It's bold and ambitious and I just love it! There is also a third street close by (Clark Ave) where you could get a good view of the church as you drive by. What's neat about this church is that after driving by it the interesting placement of the church gets your attention. Most obviously you'd want to be Catholic to get married here, if you're not they can help make that happen. After writing these venue reviews for a better part of a decade I now have a belief about churches that I have formulated over time. There are no accidents when it comes to churches. 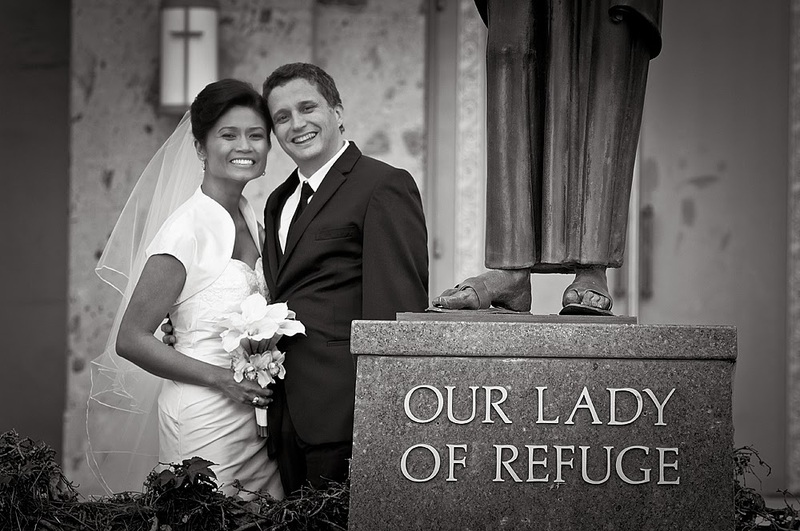 The attitude of the wedding coordinator is reflected in the attitude of the church. The horribly difficult coordinators seem to be mostly a thing of the past. I do run into them occasionally, but not as often as I used to. I don't think churches can afford to have coordinators leaving people with a bad taste in their mouth. The coordinator I dealt with was great! She really did care about her bridal couple. I felt a real sense of care and compassion for the bride. I've said it many times, you can be rude to me all you like, I won't like it but then again I'll be out of your church in under two hours. But if I get the slightest sense of indifference toward the bride I will remember it. If you go over and above for the bride, I'll remember that as well. Put a check box in the "good church" category for Our Lady of Refuge. The reviews I've found about this church places it into the family style of a church where people keep coming back due to the sense of community. If you're getting married from out of town and need to find a nice Catholic church for your wedding ceremony, there are nicer looking ones in Long Beach. As far as a church that is welcoming and accommodating I can't think of any other Catholic church in the area that tops Our Lady of Refuge. Compared to a St. Denis Catholic Church the grounds aren't as nice. It's located on a busy street and the exterior is a bit of a light orange. The front doors of the church are also lovely for group shots. The wedding I photographed at this church had 100% possibility of rain, thus we did our romantics photo session a few days earlier. I had the bride and groom meet me at the church on Wednesday and we took our time making images. The church has a lot of charm associated with it and photographs much better than I thought it would. There is only one thing that stands out in my mind about this church that is a big, huge glaring red flag. It may sound like nothing but to me, it was a turn-off. There is a small, round fountain, dead center right in front of the altar. I've seen many of them in the back of the church, a few in the center of the church between rows of pews, but never one where it was located. The church didn't allow for photography on the altar after the ceremony, and honestly, I don't think you would want to use it even if they allow it, the fountain would get in the way of the photography. If this is the worst thing I can say about your church then you're doing well. Waiting for my bridal couple to show up I saw a teacher walk in with her students who looked like first graders. It was the first time they approached the altar. She was teaching them how to do it, and for squirmish little children, they were taking this as seriously as they possibly could. Sooner or later it will all be second nature to them and them. But to watch the legacy and the heritage handed down to the students underscores the foundation of this church. There are people who got married in this church sixty years ago, lived a good life and have died. Their children grew up in the church and most likely have left the area but never really lost their love for this church. You can sense the bond between the community and the church. If you've ever had a friend who had a pair of sunglasses or glasses you associate with them who leave them behind you look at them and think that a part of their persona is in the glasses, Though I don't get overly wrapped up in this type of thinking I do believe that objects have energy associated with them that gets absorbed in over time. When you walk into Our Lady of Refuge you'll feel it. There is a lot of history, a lot of good times, a lot of friends, a lot of bonds, and a lot of stories the building holds. If you're looking for a this is an excellent place to get married in. it just seems like the type of Church that Pope Francis would like. 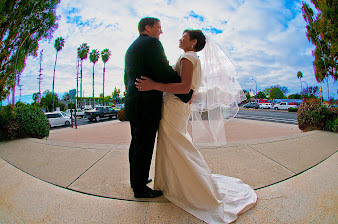 Nearby Venues: La Palapa Del Mar, Long Beach Hilton, Hyatt Long Beach, The Grand, The Reef and Lakewood Country Club.